Southampton's new chairman says that key players will not be sold to pay off club debts. 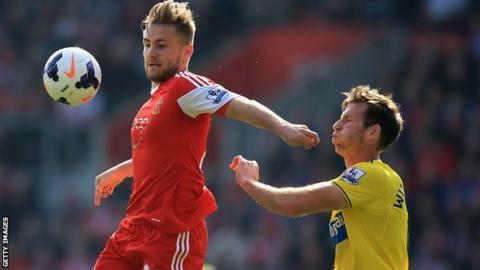 Defender Luke Shaw, midfielder Adam Lallana and forward Jay Rodriguez have all been linked with moves away. The club face a pending £30m bill for their new training ground and owe £27m in transfer payments - £22m of which is due this summer. But Ralph Krueger told The Guardian: "We are definitely not factoring in a big player sale." He added: "What we have here is very good and we are doing everything in our power to keep this group together." Krueger is also determined to keep manager Mauricio Pochettino, who cast doubt on his future in January following the departure of previous chairman Nicola Cortese. The Southampton boss, under contract until the summer of 2015, said then he would decide his long-term future at the end of the season. But Canada-born Krueger said he was encouraged by the fact that Pochettino had demonstrated commitment at his previous club Espanyol, where he was in charge for just under four years. Krueger, a consultant to his Canada's gold medal-winning ice hockey team at the 2014 Winter Olympics, joined the Saints board in February. He said: "We are going to create a culture that this is an excellent organisation to be a part of at all levels. "Whatever the dynamics of football, or the situations that can evolve outside of Southampton, we will just keep moving forward."